The Product family MiA® from Condensator Dominit GmbH is a current controlled active filter which maximize values and minimize losses. Frequency converters and other energy efficient solutions play a substantial role in our energy transition policy. Unfortunately, because this kind of equipment has a non-linear U-I-characteristic, it causes critical system perturbations by harmonics. Active filters provide reduction of harmonic currents, reactive power, flicker minimization and grid balancing. These provisions are necessary in grids, where the perturbations lead to non-compliance with relevant standards. EN 50160 describes the perturbation types for public low- and medium voltage distribution networks. These compatability level guidelines state the minimum requirements for a long-term fault-free operation of consumers in the grid. EN 61000-2-4 describes simultaneously the compatibility levels in the industrial grid. EMC Class 2 of this standard is compliant with EN 50160. Devices for public grids may therefore operate in class 2 industrial grids. If compliance levels given in standards are exceeded, malfunctions of production relevant machines and control systems can occur. Suppliers of these devices are then free to withhold the warranty and they are not liable for damage claims. 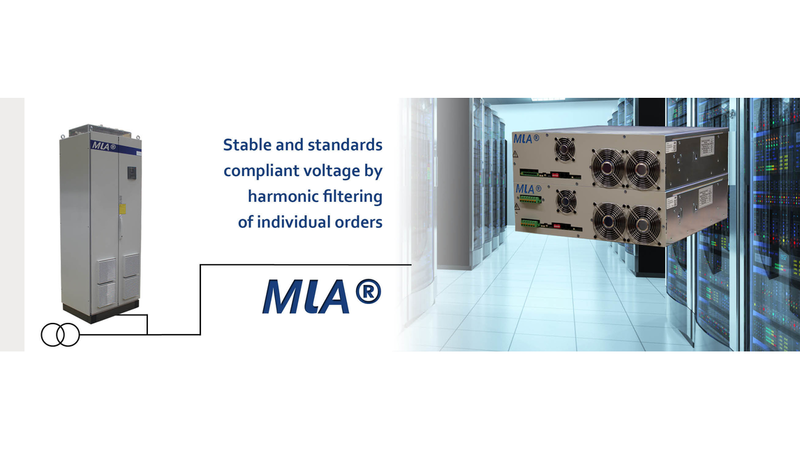 MiA® provides the necessary conformity with standards in your distribution system and therefore guards against disturbances, failures and loss of warranty and rights of compensation. Protect your grid with MiA®!